One of the many consequences of our ongoing culture-wide attempt to iron out life’s creases is this: when faced with real, intractable difficulty and threats that cannot be ushered away, modified or exactly predicted, we go into tailspins, and panic. Astrologers and their clients are by no means immune to this. Astrology is both a healing and a wounding art. Its practice can wind up individual and collective fear. We need to be aware of this. Perhaps it is also worth pointing out that astrologers can be hubristic, arrogant and just plain wrong in their attempts to know what planetary patterns mean before we all get there – this can be damaging to their clients as well as themselves. 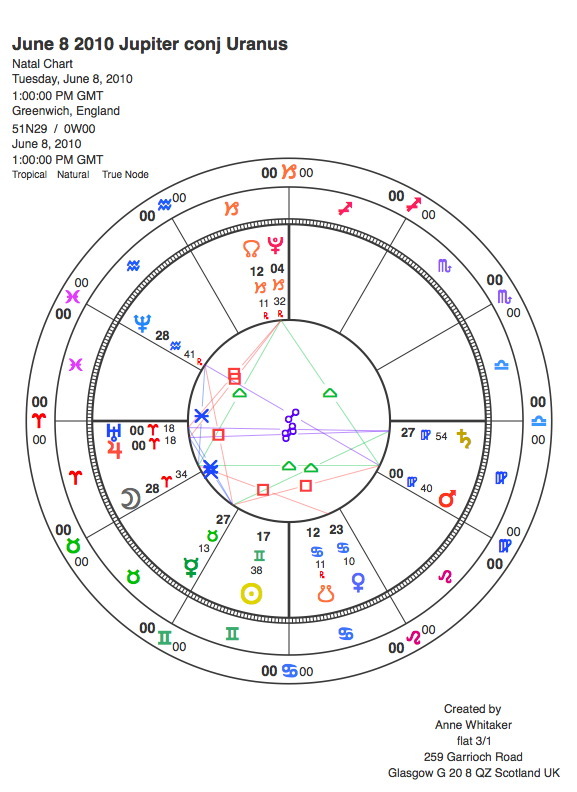 Having said all that, I am not sufficiently evolved yet to refrain from speculations of my own by staying entirely in each moment as it is happening, serenely abandoning my ego in accepting whatever the Fates choose to throw at me when Jupiter/Uranus in Aries, Saturn heading back to Libra, and Pluto in Capricorn zone in on my 1.5 degree Mars in Cancer in the Tenth House….. Part of me is out there fist-shaking. The other part is hunkered in the bunker with the Linus blanket and the food supplies. Plenty of us will be swept by the firestorm of restlessness, idealism, imaginative enthusiasm, pioneering innovativeness, anger, ruthlessness and rebellion against constraint which we expect the upcoming Jupiter/Uranus sweep to bring. But the dynamic fire and air of astrological Jupiter combined with Uranus has a particular job to do, symbolically speaking: its function in enabling evolution is to see no limits. The Aries backdrop of the pair’s first meeting in June 2010 emphasises this strongly. I feel it is more helpful than otherwise, through the lens of astrology, to have some advance warning of our movement into, and through, such a tempestuous energy field promising great disruption collectively and individually – also opening us up to possibilities for growth as yet unknown. But we need to be humble in the face of these great forces, recognising that there is only so much we can do to prepare for them. Uranus moves into Aries on 28th May 2010. So what are the speculations that I am unable to resist making? One year on, I am happy to let you browse these, and the range of easily-accessed articles on the political, economic, scientific, religio/spiritual and individual impacts of the upcoming pattern offered by the Web. For example, Theodore White’s Global Astrology Blog features some fine, detailed mundane astrology with a number of specific predictions. There are also some very useful how-to-cope toolkit articles eg the Cardinal Cross series on Donna Cunningham’s excellent blog Sky Writer . And me? Well, as you will discover on reading “Jupiter Meets Uranus,” my research interest centres on observation rather than prediction. I find it enduringly fascinating to watch how the essential meaning of energy patterns ripples out and touches everything. From the tiny microcosm of individual existence (I had 17 research subjects, all of whose lives were radically changed by the impact of the February 1997 Jupiter/Uranus conjunction in Aquarius) to the vast macrocosm of 500 year blocks of history, I tracked the ripple of Jupiter/Uranus energy outwards from its core meaning, and was amazed by what I found. My inclination now is, simply, to wait and see what transpires. In 1997, I collected large amounts of data. This time, I shall let you out there do it, and tell me your stories. 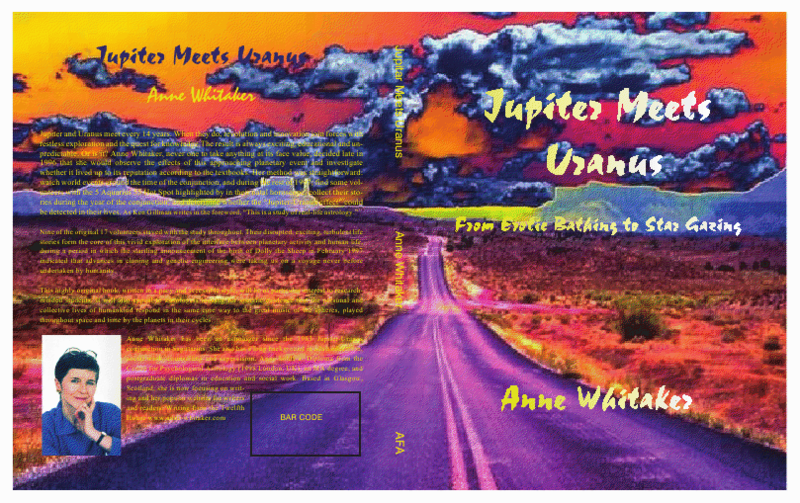 If there are enough of them, I will post them on my “Jupiter Meets Uranus” site, thereby adding to our understanding of how the symbolism of the ‘music of the spheres’ plays out in both individual and collective life here on earth. As I draft this, (9th April 2010) the Jupiter/Uranus conjunction is just applying within a ten-degree orb. Its ten-degree orb of separation will complete in just under a year’s time. The Large Hadron Collider has successfully completed the first stage of its quest for the Higgs Boson….vast amounts of data now have to be processed. President Obama has just signed his fiercely-fought for healthcare bill, albeit watered down, into law. He has also just signed a nuclear arms reduction treaty with President Medvedev of Russia. There is collective anger rising in political upheaval, notably in Thailand and Burma – and in Iran, as dissent continues to be tamped down….but for how much longer? The Catholic Church is becoming mired in possibly the biggest crisis of its history, as the focused rage of generations of those sexually abused by those religious who were supposed to nurture them, rises to the surface of a society no longer prepared to collude with such abuse….. I am revising and completing this article on 29th April 2010: just over two weeks after the Icelandic volcano’s eruption on 14th April 2010 – fire through ice! – caused several days’ disruption of the world’s air travel following UK air space being virtually closed down. (Ours was just one of the holidays ashed-out…) On 20th April, the Deepwater Horizon oil spill off the Louisiana coast became the largest oil spill in US history. NASA has just unveiled stunning images of our Sun from a new satellite designed to predict disruptive solar storms. On 27 April there was an announcement that the biggest ever telescope was going to be built in the Atacama Desert to enable us to see farther into the cosmos than we have ever seen before…..
As I publish on 25 May 2010, just before Uranus’ shift into Aries, the biggest Jupiter/Uranus scientific breakthrough thus far was announced on 20th May. Craig Venter’s company has created the first artificial living cell – using highly sophisticated computer technology. Fasten those seat belts. Here comes that wild ride…. ps again: researchees out there: don’t forget to keep taking notes, and report in to Ground Control (ie this site) now and then. Good luck! !